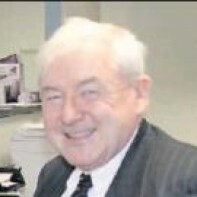 Fred Matthews is a former director of elections for Fine Gael in Louth. He was born in Dundalk, where he currently operates a pharmacy in Park Street. He is also a former director of Ardee Credit Union and has served on the North Eastern Health Board. Matthews played rugby with Dundalk RFC and Gaelic with St Mary's of Ardee. He was a founder of Ardee RFC and is a former coach and president. Methinks Fred is doing this to feel involved again.